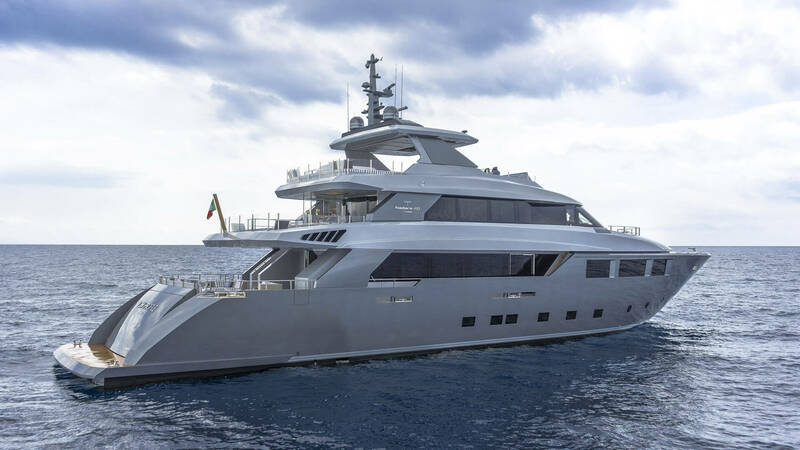 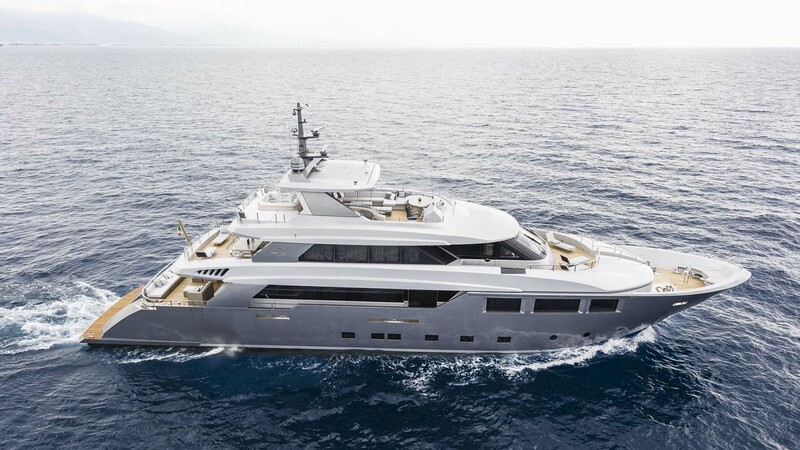 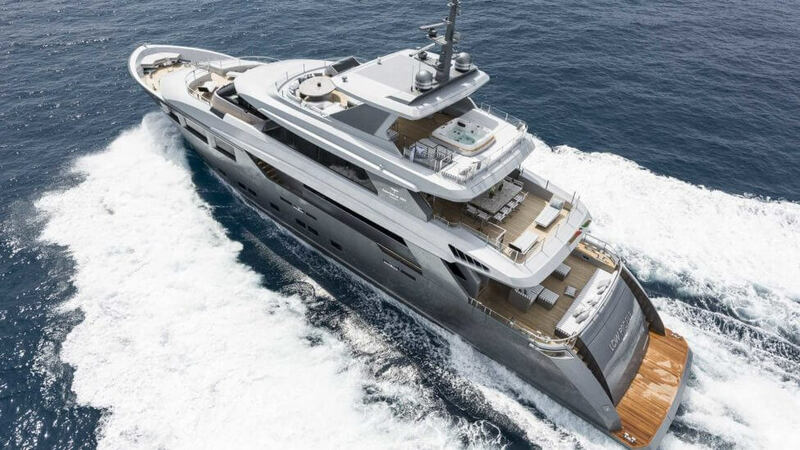 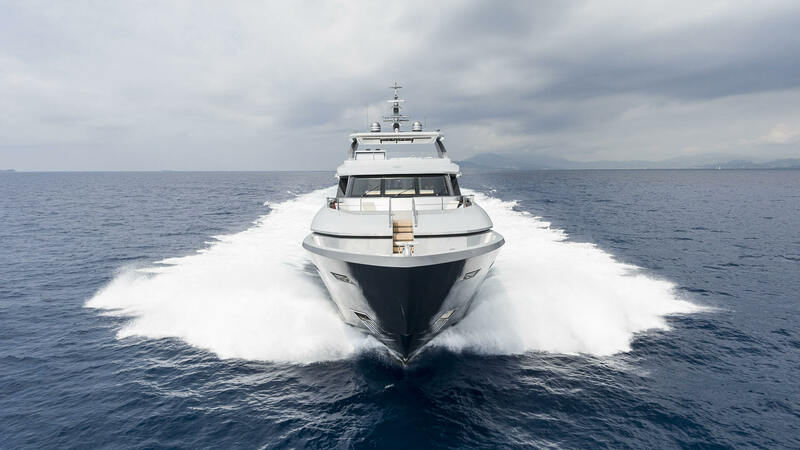 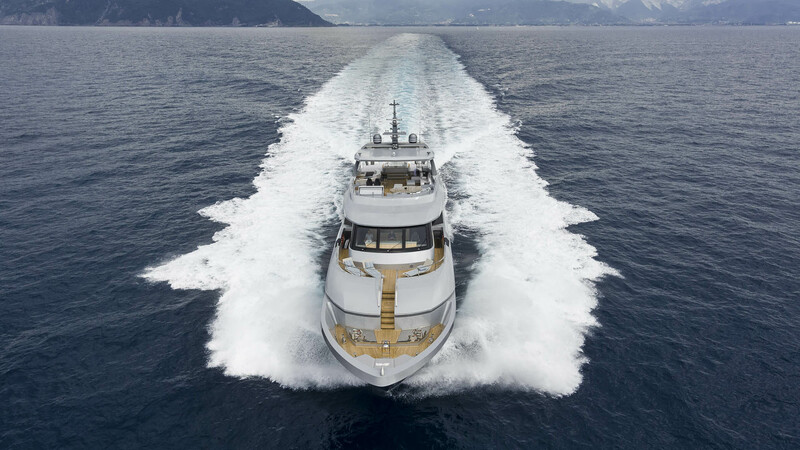 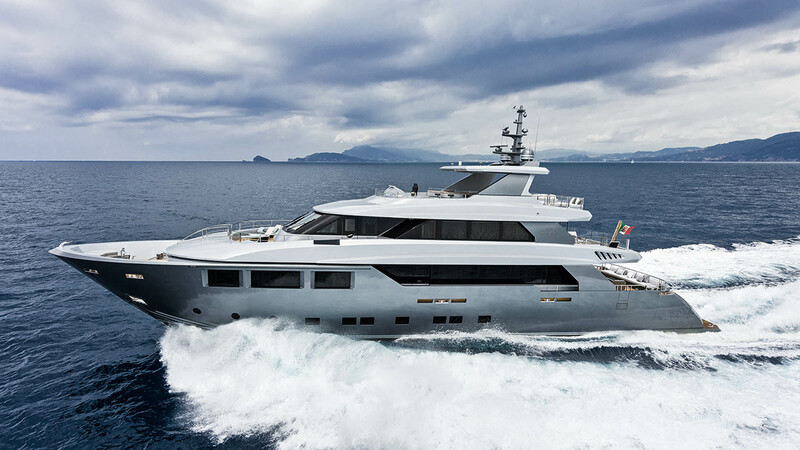 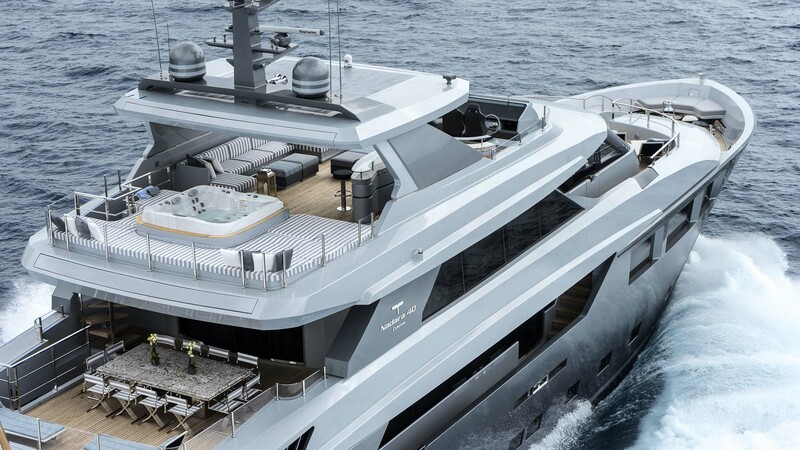 With a planing hull aluminum and can reach a top speed of 26 knots, Low Profile is a super luxury yacht three bridges along 40 metres, class Nadara. 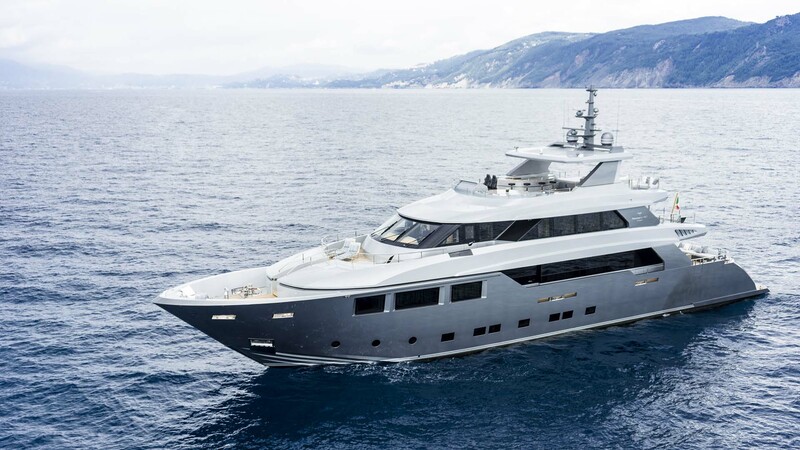 Modern lines and attractive are emphasized by dark gray hull which contrasts elegantly with the superstructure clearer, reducing in this way the profile that looks more racy and sporty. 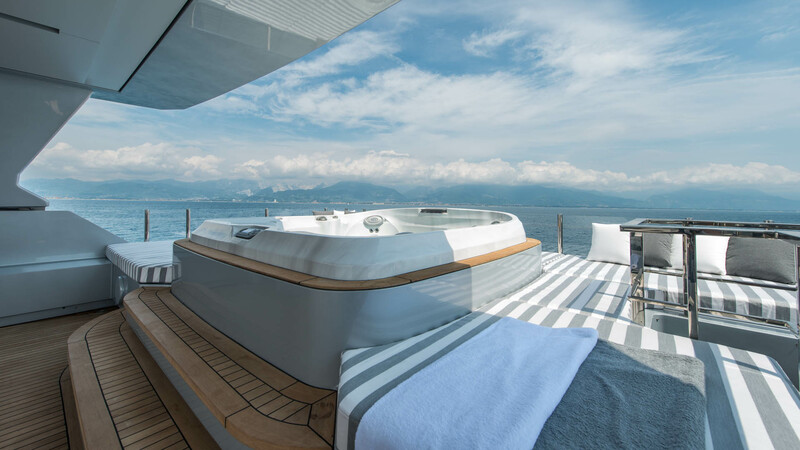 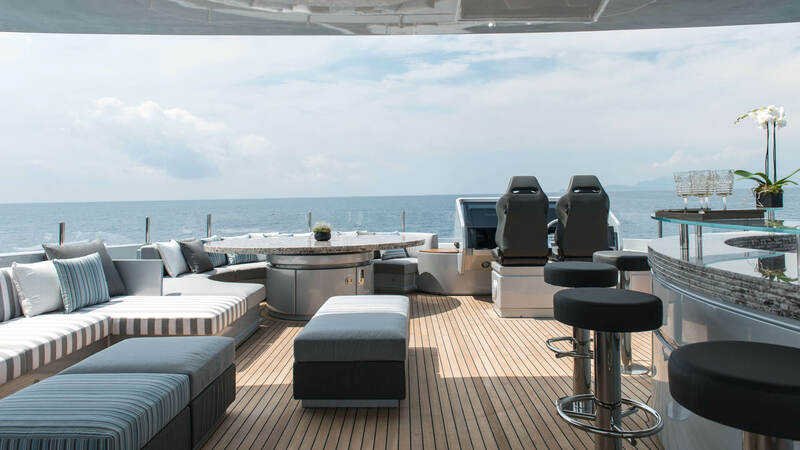 The pride of the exterior is sun-deck, which is a true terrace overlooking the sea, equipped with a large jacuzzi aft, marble and glass bar and barbecue. 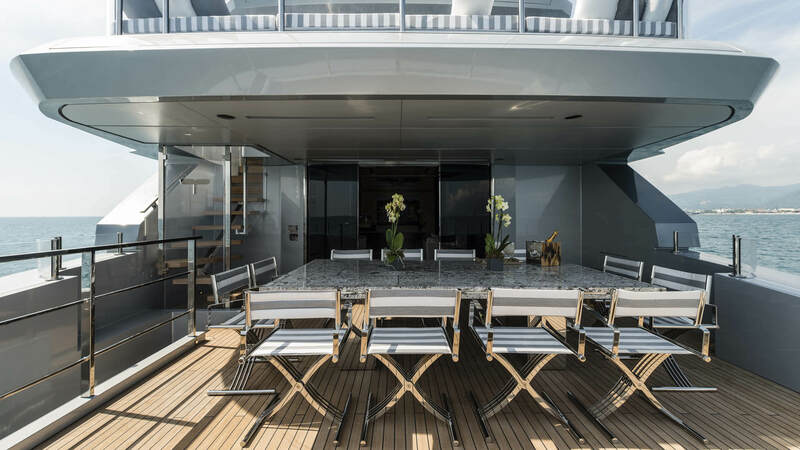 A spacious dining area is aft of the main deck with a table which can comfortably accommodate up to 10 people. 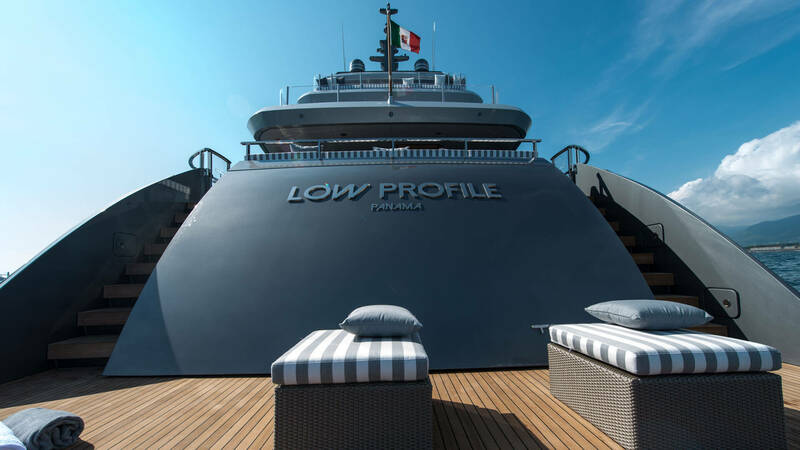 The crew area is located at the bow in an independent area with two cabins below decks and a captain's cabin on the upper deck with direct access to the wheelhouse. 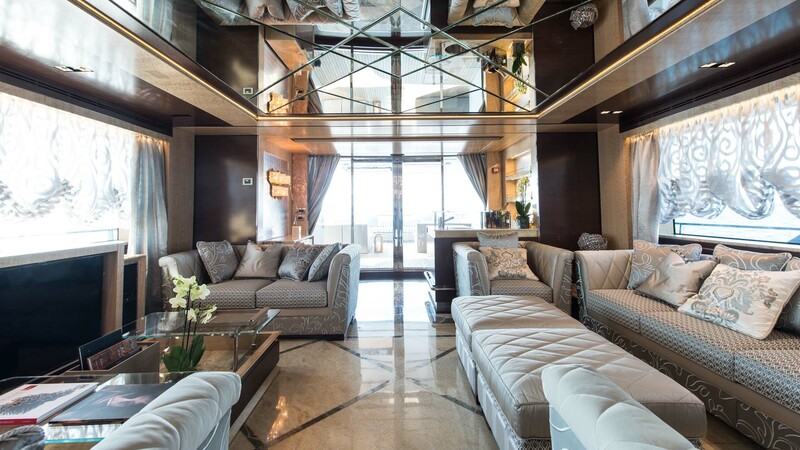 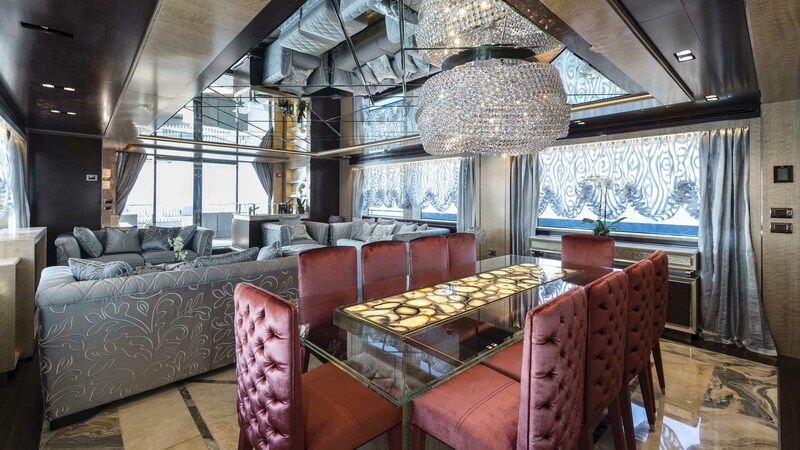 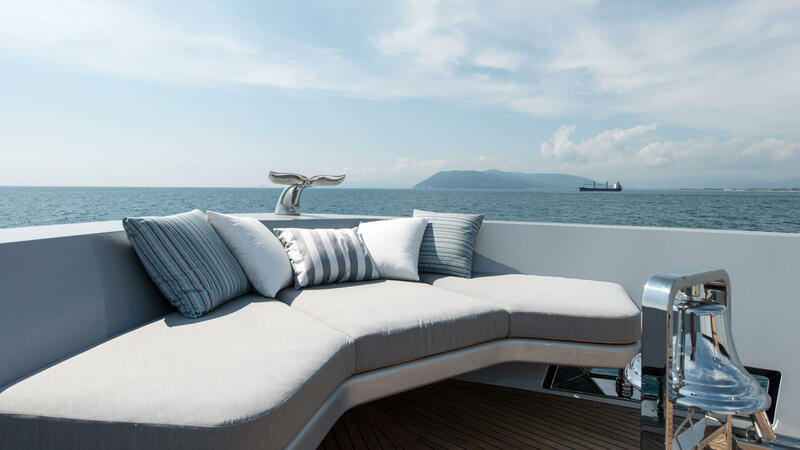 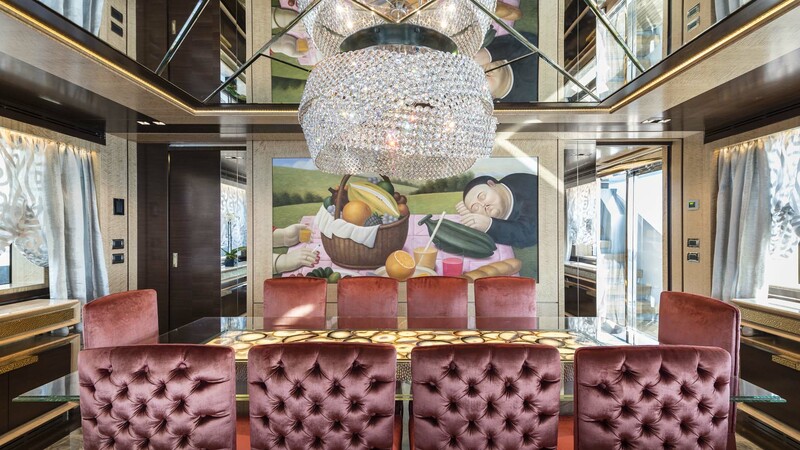 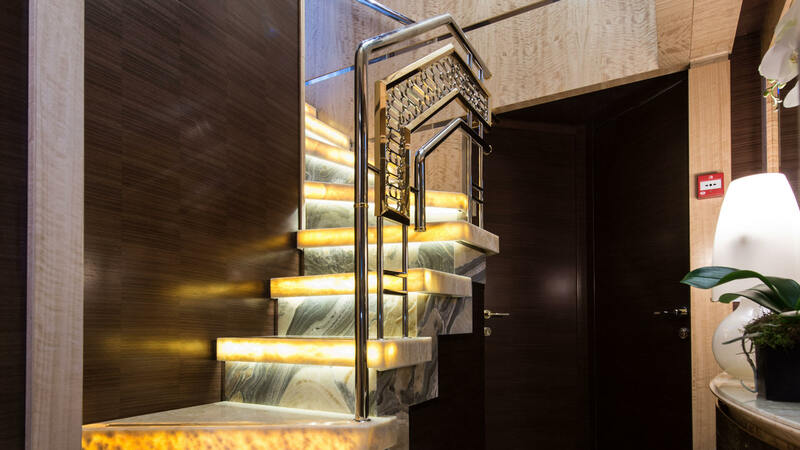 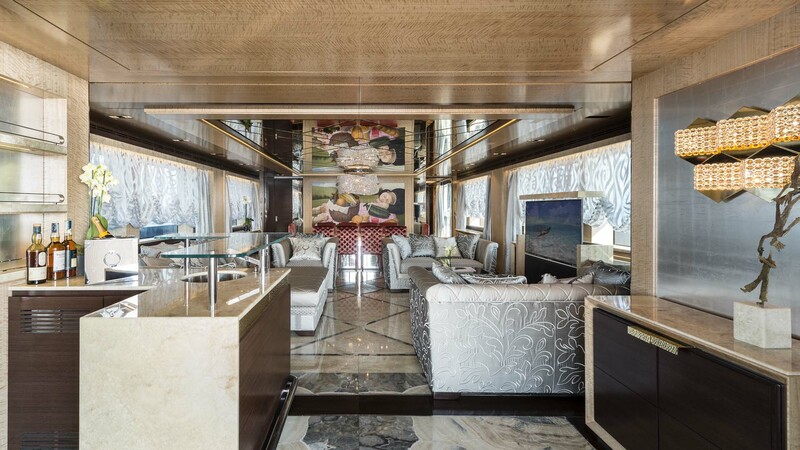 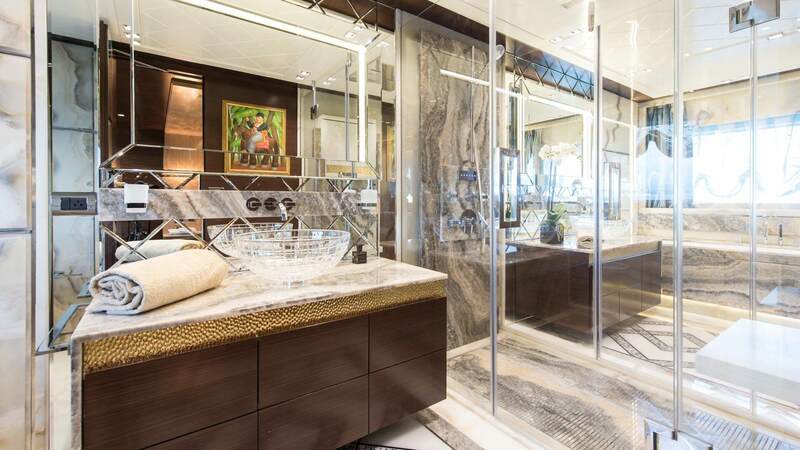 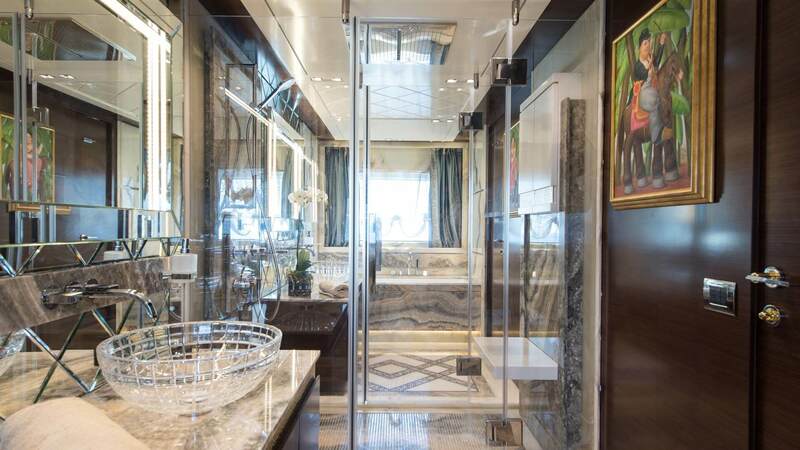 The main deck features a large living room furnished with sofas and armchairs in rich fabrics and finished, a wet bar with marble bar, a large table for 10 people with glass and mirrored ceilings set backlight Panel in the Middle, with brass inserts and Crystal lamps. 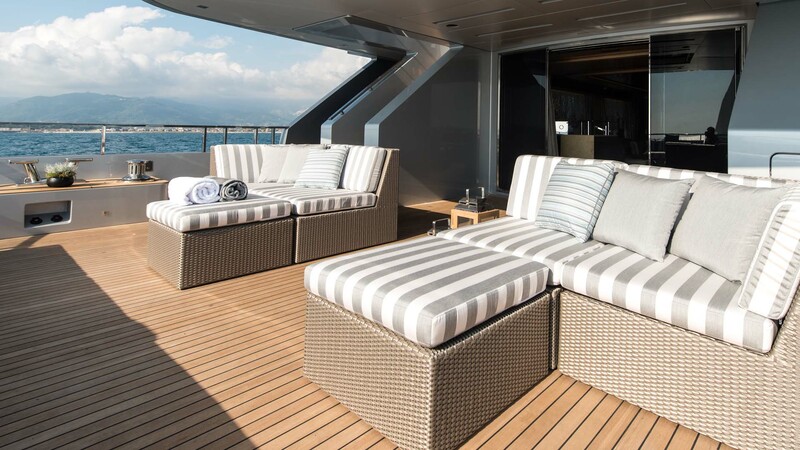 Conviviality is also reserved for the spacious sky-lounge on the upper deck that has large Windows that run along the entire length. 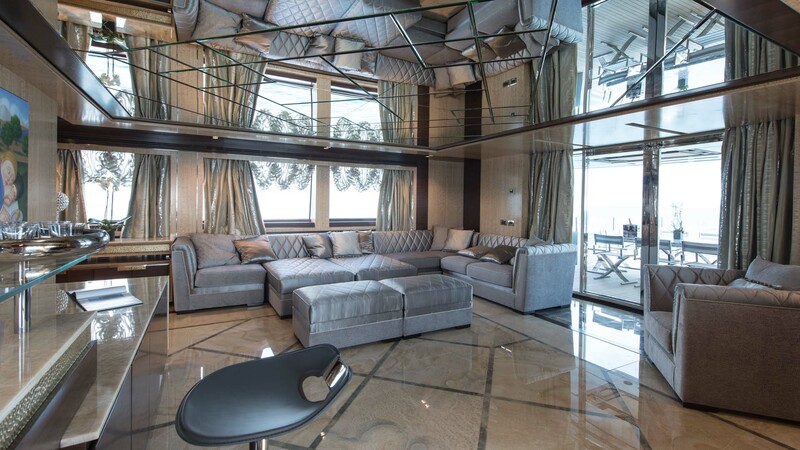 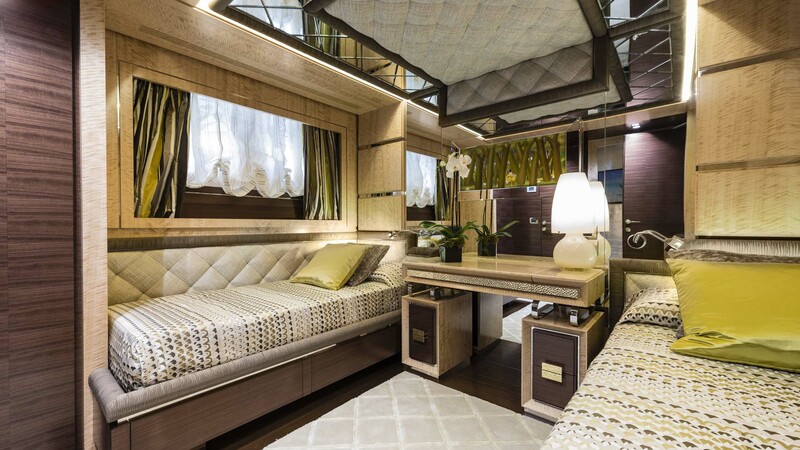 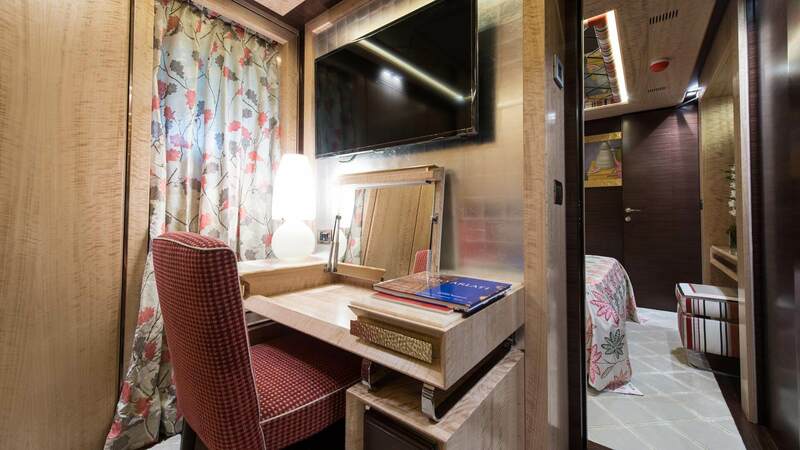 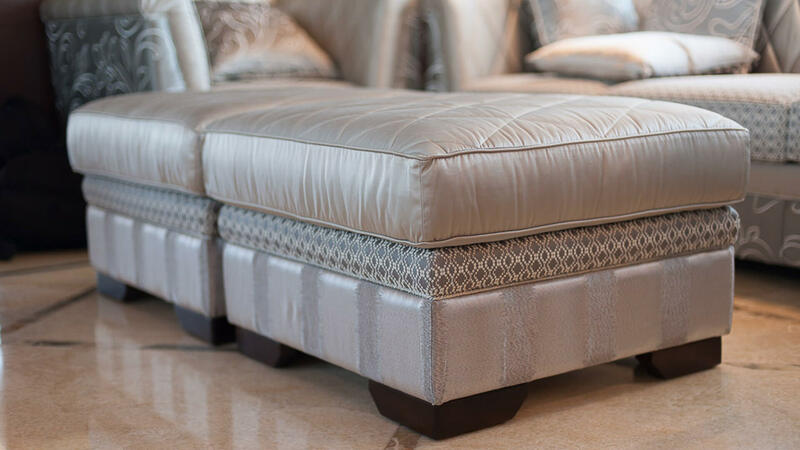 Marble floors and mirrored ceilings frame a corner sofa with double chaise cover Panel and is convertible into bed. 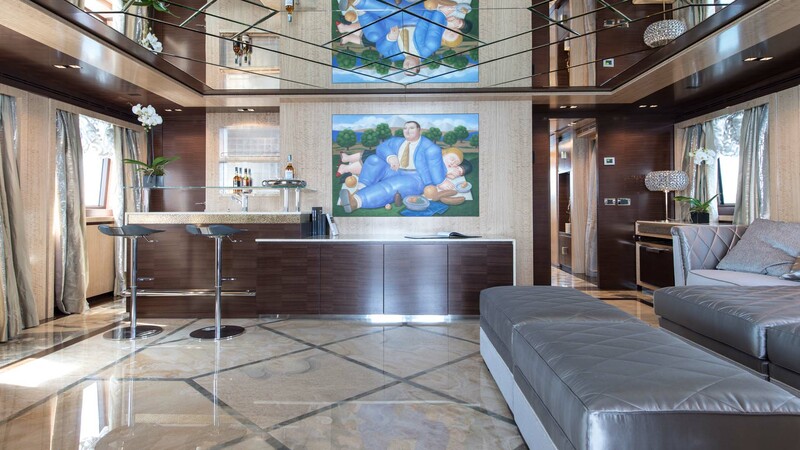 Here we also find a 65 inch TV "and wet bar for maximum entertaining guests on board. 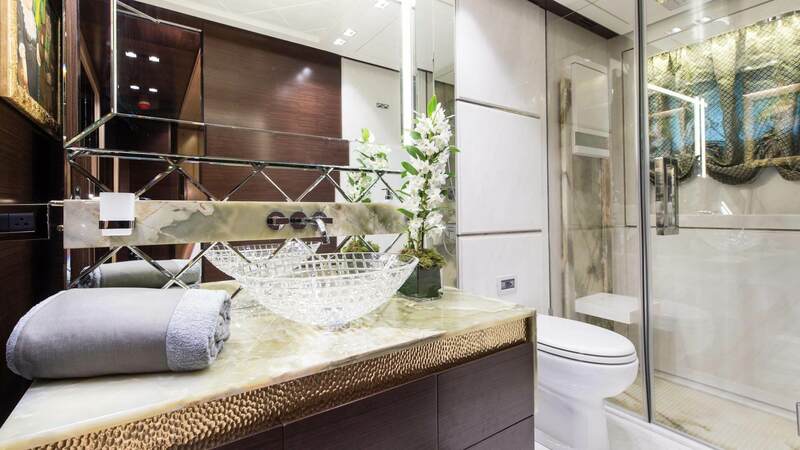 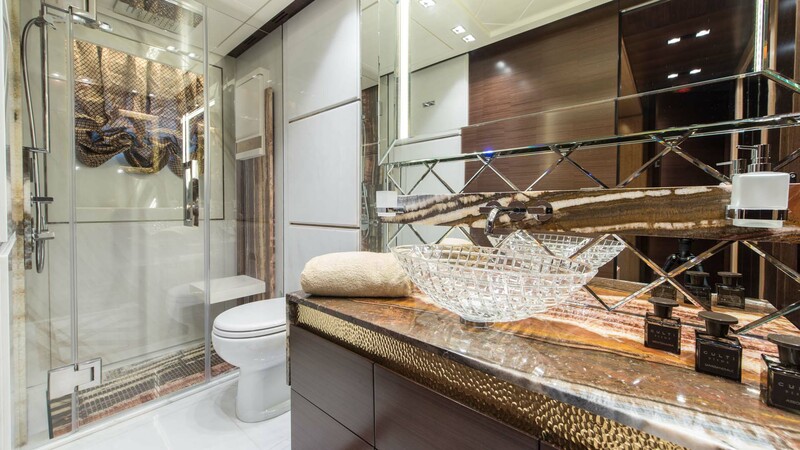 At the bow was placed the full beam master stateroom featuring large Windows which radiate natural light environment. 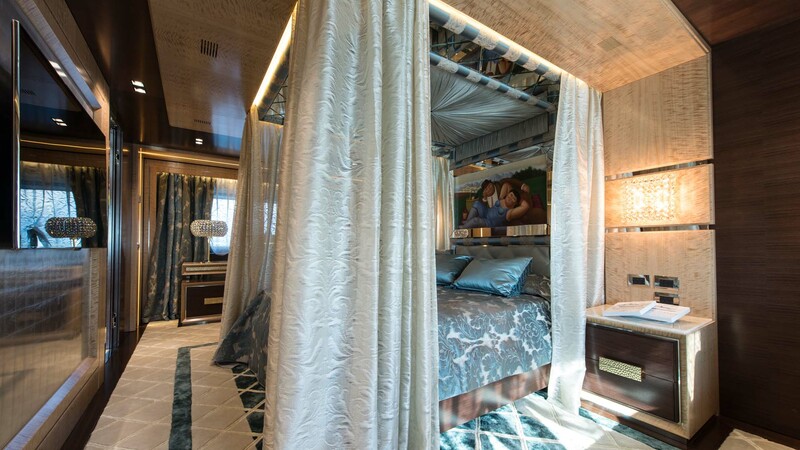 On the ground was placed a very precious ivory and blue carpet that acts as a "tray" to the canopy bed with tufted headboard. 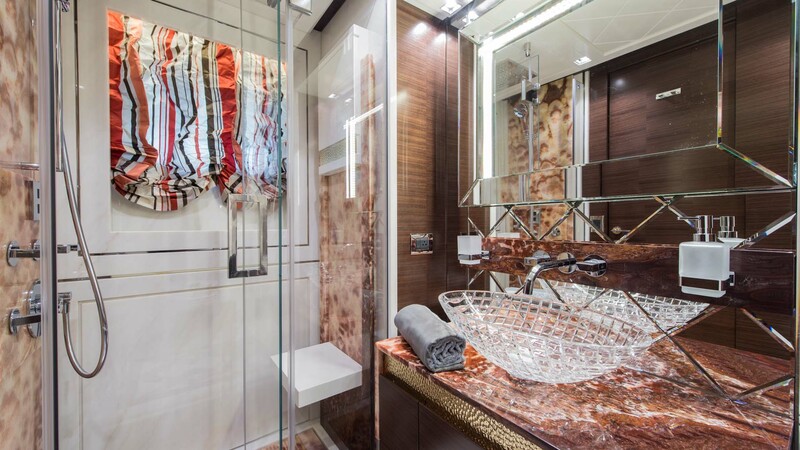 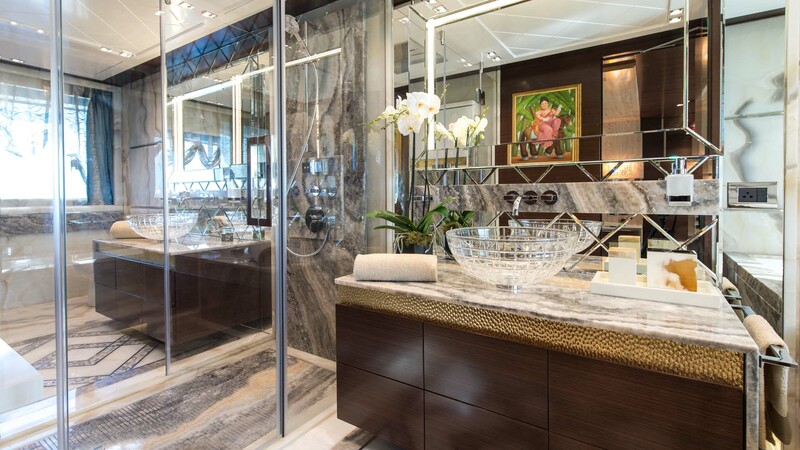 The master bathroom has glass basins, marble floors with steel inserts and diamond design, shower and bath with Chromotherapy. 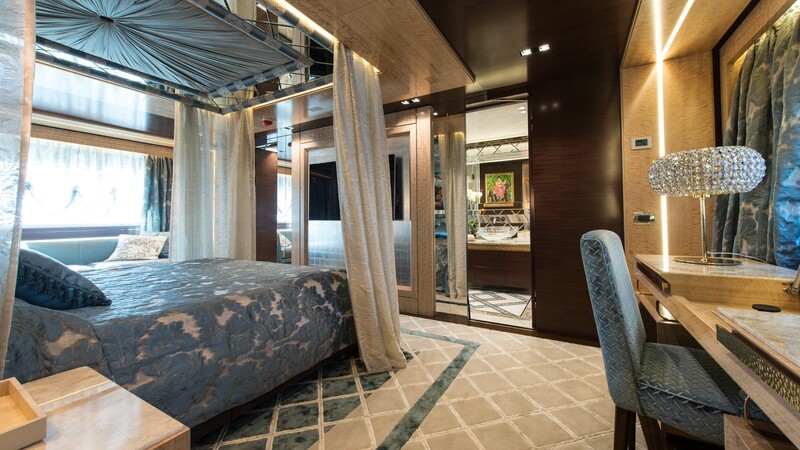 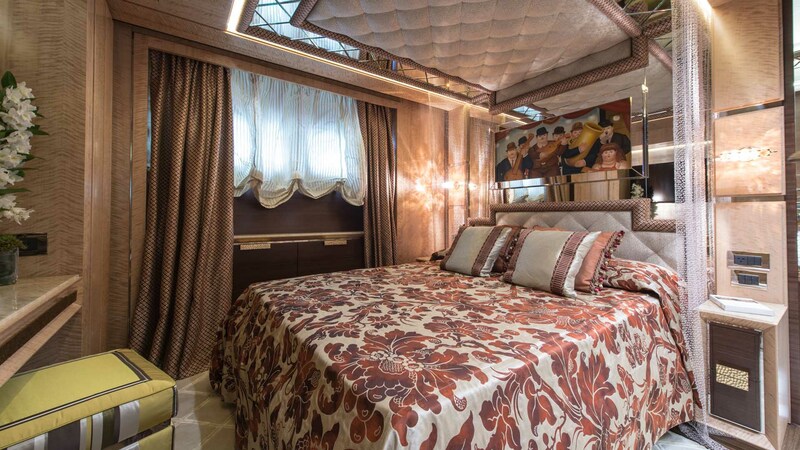 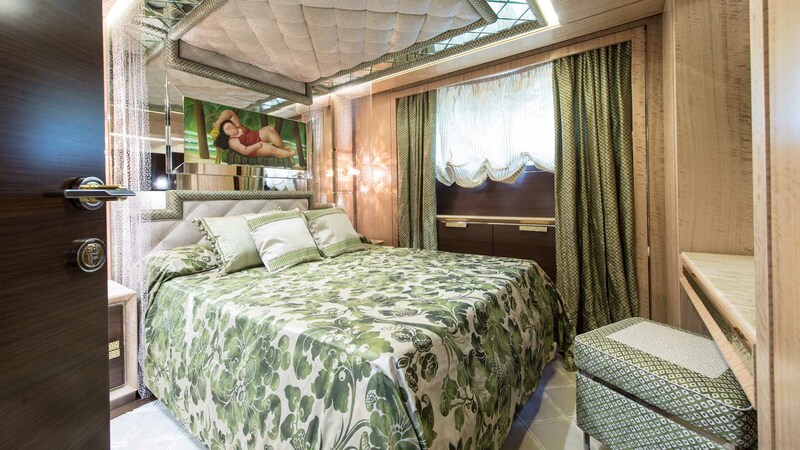 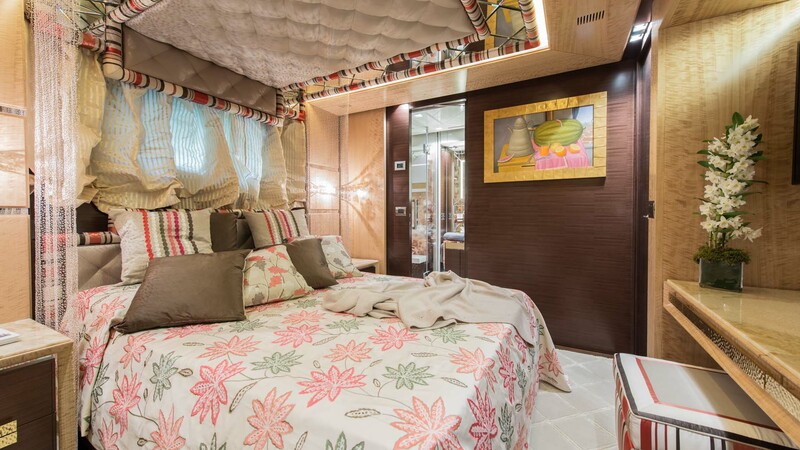 Complete the sleeping four guest cabins on the lower deck and include two double, one twin and a large VIP with a separate study.